Up to the Second World War, in Burgundy, mustard was cultivated in woodland, in the charcoal burner clearings where the charcoal kilns, a large number of which existed in Burgundy at that time, were located. The discarded "ashes" from charcoal burning were rich in potash and encouraged the growth of mustard, the seed for which was sown by the charcoal makers. When the plant reached maturity and the seed was gathered, the collectors bought the seed from the charcoal makers and then sold it to the Dijon region's mustard makers. 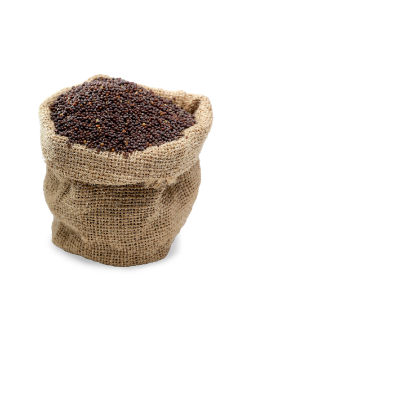 Due to the large number of charcoal producers and a smaller population level, this form of mustard seed cultivation was largely sufficient to supply the Burgundy mustard producers. However, due to the falling off in the demand for charcoal for industrial use, and the subsequent reduction in the number of charcoal burners, the drop in mustard cultivation forced the mustard manufacturers to look to other regions (mainly Marne, Somme, Seine-et-Oise, Loiret and Indre), for their supplies. Here also, cultivation also grew less and less profitable until it was finally abandoned, leaving the mustard makers no choice but to go outside of France, especially to Canada and the United States, where mustard is a more profitable crop for Canadian and American farmers.  The Burgundy Mustard Association, founded by the regional growers and manufacturers, in which the FALLOT COMPANY plays an active role, has, over the last few years launched a programme aimed at giving a new impetus to mustard cultivation in Burgundy. While several attempts to reintroduce mustard cultivation to France have failed in the past, the new initiative aimed to increase its chances of success by also filing a PGI (Protected Geographical Indication) application, which was approved in late 2009. 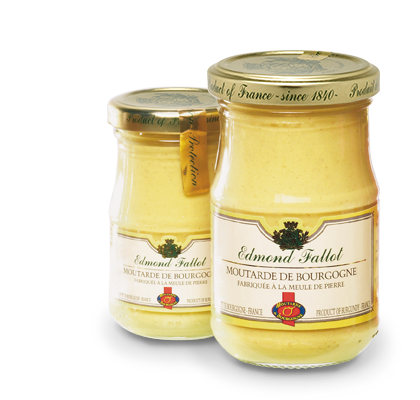 In fact, the members of the association have decided to offer a product that is distinct from Dijon Mustard, which has become a generic name which is produced just as well in a number of other countries such as Holland, the United States or Japan, as it is in France. 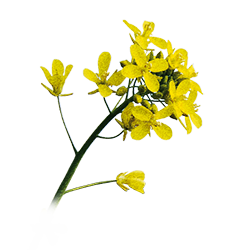 Manufactured from seed grown in Burgundy and combined with AOC Burgundy wine, "Burgundy Mustard" is a product deeply rooted in Burgundian soil. To give the consumer a guarantee of the origins of the product they purchase, as well as to enhance the work carried out by an entire commodity sector, the association has decided to place its product within the framework of a certificate of conformity as set out in the Law of the 30th January 1994 relating to the recognition of food products through Protected Origin Identification. - To develop the region's agro-economic fabric. 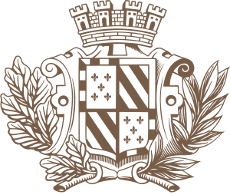 The Burgundians and the Dijon folk in particular, have had the well merited reputation of being fine gourmets. A land of vineyards, Burgundy was always well located to furnish the increasingly numerous mustard makers in and around Dijon with new wines and vinegar. A limestone region with dense woodlands, erstwhile the domain of the charcoal burners, the terrain is ideal for the cultivation of particularly strong and biting seeds. Little by little, the cultivation of mustard therefore developed in the region, that was thus assured of a long term self-sufficiency in terms of raw material supplies. 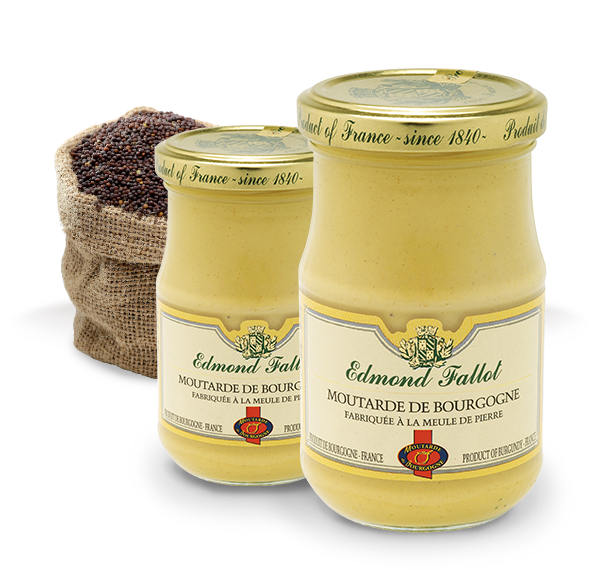 It did not take very long for mustard to become a real tradition in Dijon, where its manufacture was governed by a decree dating from the 10th August 1390. Ethics and hygiene became the key words of the profession. In the eighteenth century, the discovery of verjuice (grape juice harvested in Burgundy), put the finishing touch to this noble product. 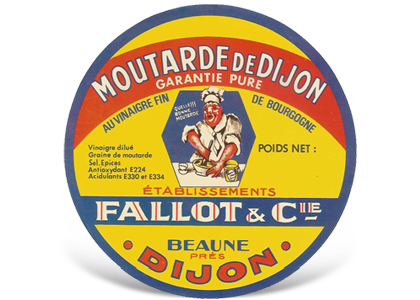 Verjuice (added to brown mustard seed) coupled with the milling of this mixture using millstones (thus avoiding heating of this highly sensitive paste) were to finally render the World-renowned high quality DIJON MUSTARD. 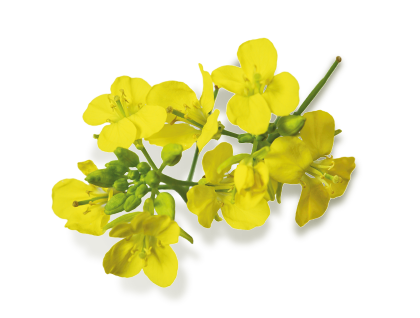 In the far distant past, the Chinese, Greeks and Romans were already transforming mustard seed (a yellow flowered plant) into a smooth and aromatic paste. Even though the benefits gained by the Greeks and Romans from the medical usage of this plant were undeniable, it was also very rapidly introduced into the kitchen where, for its culinary role, it was combined with vinegar, already in use by these earlier civilisations, one of the important characteristics of vinegar being that it inhibited the plant's counter irritant properties. During the middle ages the words "mustard" and "sénevé" appeared simultaneously in 13th century French. 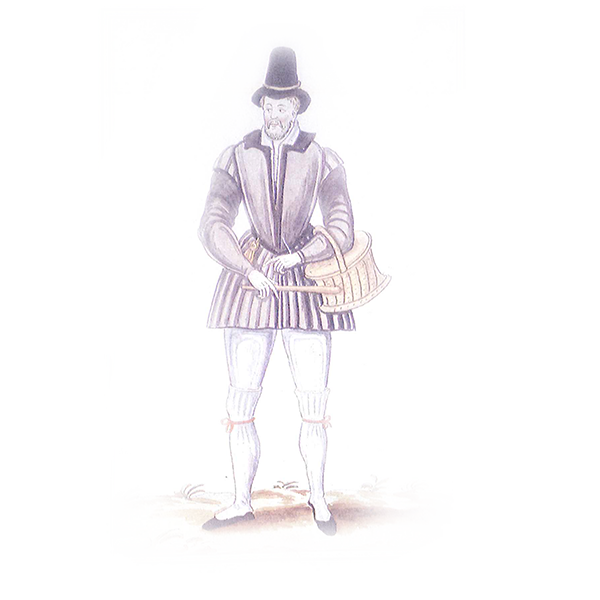 The word "moutardier", which described both the mustard maker and the mustard merchant appeared for the first time in the Paris Royal Tolls in 1292, and in 1351, a Decree was pronounced that gave the merchants the right to use weights. Mustard was used for a long time, mainly among the poorer families to replace pepper, at that time a very expensive imported spice, in order to add flavour to their food. However, with the advent of the high period of great feasts and banquets, especially in the Renaissance epoch, little by little mustard began to find its way onto the tables of the more privileged classes: Rabelais incidentally being a case in point. In the 17th Century the first smooth and aromatic mustards began to make an appearance and from this century onwards, the quality of mustard became a measure that was synonymous with riches, refinement and pleasure. In the 18th and early 19th Centuries, manufacturers rivalled each other to create a thousand new recipes. 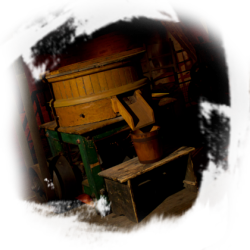 When the industrial revolution first made its appearance in France around 1850, the manufacturing process of mustard (milling, grinding ,sieving) which up to then had always been done by hand, became mechanised. 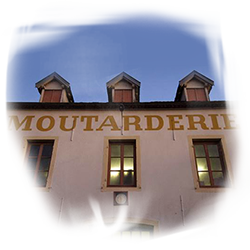 In the 20th Century the regulations governing manufacture became increasingly rigorous: as a result a 1937 Decree, (which was to be finalised and brought up to date in July 2000) defined the manufacturing conditions and types of mustards. 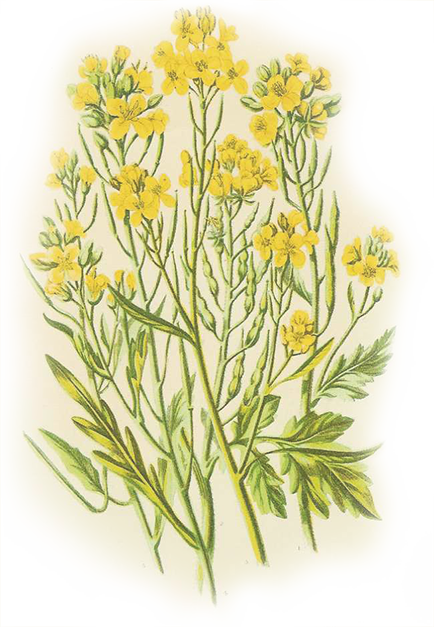 Today, the craftsman methods of manufacturing mustard have almost totally disappeared. 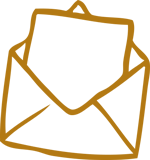 Only a few rare manufacturers, amongst which the FALLOT MUSTARD MILL is proud to be numbered, still use traditional stone milling methods which retain all of the paste's gustatory qualities, and give our mustards their incomparable taste and flavour.